How Do We Make The Plans? What goes into the engineering of do it yourself plans? When you purchase and download project plans from Mechanical Elements, you get a TON more than first meets the eye. This is how we make DIY plans for you. How is it done? The process is design, prove and eventually publish the plans available for you to buy. But, there’s more. Starting with the idea, we then . . .
– Develop the concepts and synchronize all the various aspects (including options) . . .
– Design the products using 3D CAD software . . .
– Prove the Design . . . using FEA, and other analysis tools . . .
– Create the detail drawings . . .
– Build Prototypes and test as needed with each . . .
– Modify the design if needed and revisit any of the above steps for verification . . .
– Write the instructions . . .
– Capture images of the design, options, and the process steps . 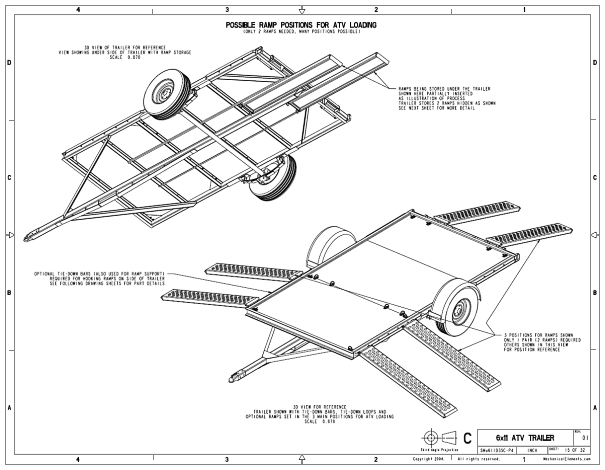 . .
– Bundle the package of drawings and instructions in a PDF for you to download . . .
– Create the product web page with information and proper descriptions and links to buy. All this is done at Synthesis, yet the plans are made with you in mind — and we try to respond to your requests. After all the above, the plans are there for you to simply purchase and download. As our customer, you get to purchase what took us many hours, sometimes months to produce. And, you buy it all for a tiny fraction of the real cost. What Does It Cost To Make DIY Plans? It’s kind of like building a spec home, but different. Let’s use one of our Tiny House trailer plans for example. A customer that contracts us to design a custom Tiny House trailer will likely pay something between $1200 and $2000 assuming we can build from plans that we already have. Pricing depends on complication, of course, but also size and special requirements for loads or analysis. Or, starting from scratch, a complete design that does not leverage work we have previously done is more like $3000 to $4000. The big deal is found when your design does not require a lot of special features. For that, we’ve already done the work for you, and you can purchase one of our already proven designs for less than $30. Basically 1/100 of the cost. That’s the Tiny House Trailer example. Of course, we have many types of plans in the Plans Store. 99% Off. Now That’s A Good Deal! Now you have a glimpse at the effort required to make DIY plans. Here at Mechanical Elements we love a good project, and we love to see others also successful in building and learning. The rest of the reason for “Why do we do it?” is covered more on the About Us page. Enjoy the Plans we have for you. We also hope you enjoy and learn from the Tips and Helps published From The Mechanic. Great plans are an awesome place to start your project, but that is just the start. We encourage you to customize the plans, to make them fit your needs. Use these plans as a start for your project knowing that the bases are covered, then add the options and customizing features that make the end project totally you! See some customer projects others have done, then dream up your own best versions. Trailer Build: Where Does The Axle Go? Video – Why Do Some Trailers Tow Stable?